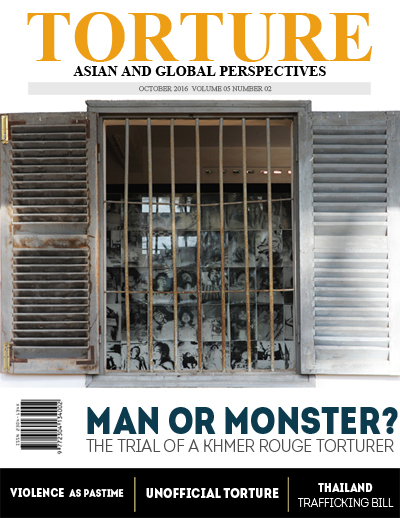 (Hong Kong, 30 September 2016) “The evacuations and arrests were just part of a larger Khmer Rouge project of mass social engineering which involved obliterating everything that smacked of capitalism, privatism, and class oppression,” writes Alexander Laban Hinton, Founding Director, Center for the Study of Genocide and Human Rights and Professor of Anthropology at Rutgers University. He is the co-editor of Colonial Genocide in Indigenous North America, published by Duke University Press, and author of the award-winning Why Did They Kill? : Cambodia in the Shadow of Genocide. “Broadly, the Khmer Rouge targeted Buddhism, the family, village structure, economic activity, and public education – key sociocultural institutions in prerevolutionary Cambodia. More specifically, they sought to eliminate corrupting influences from the past by banning non-revolutionary art and styles, destroying and damaging temples, curtailing media and communication, ending traditional holidays and rituals, separating family members, homogenising clothing, and eliminating private property, including photos and other mementos,” Hinton observes. The full text of this essay is available in the latest issue of the Torture: Asian and Global Perspectives (Torture Magazine), to be published soon. The essay was adapted from the author’s forthcoming book, which focuses on the commandant of the S-21 security centre where thousands of unarmed civilians were eliminated. During the Khmer Rouge’s brutal reign in Cambodia in the mid-to-late 1970s, a former maths teacher named Duch served as the commandant of the S-21 security centre, where as many as 20,000 victims were interrogated, tortured and executed. “The current regime has to face the challenge of disciplining the very same state machinery that brought disrepute to the previous regime. The lessons learnt should not be in vain. The state should henceforth be seen as the protector of its citizens and not as the perpetrator of abductions, torture and enforced disappearances. It should not also be seen as a protector of those responsible for enforced disappearances or other offences. The Disappearances Convention does not condone enforced disappearances even when the country is at war or in situations of internal political instability,” he continues. M.C.M Iqbal is well known Sri Lankan Human Rights activist who had been involved in conducting inquiries and investigations into nearly 30,000 complaints of disappearances of persons in Sri Lanka while serving with Presidential commissions of inquiries appointed for this purpose. Henry Armand Giroux received his Doctorate from Carnegie-Mellon in 1977, before becoming a professor of education at several universities. He also served as the Director of the Waterbury Forum in Education and Cultural Studies and authored numerous of books and essays on the subject of pedagogy. Our regular columnists, Tisaranee Gunasekara, Ron Jacobs, Binoy Kampmark, and Javeria Younes, provide their contributions, while this issue’s guest column is written by Phattranit Yaodam. The online version of Vol.5 No. 2 will be available on www.torturemag.org soon. Finally, it is with pride that we inform our readers and contributors across the globe that this is the fifth anniversary of Torture: Asian and Global Perspectives. After five years’ worth of publications, we feel that we have produced a meaningful contribution to the larger discourse centred on the eradication of the practice of torture. As we work to rebrand the magazine to build our audience and strengthen the anti-torture community network, we thank you for your continued support.